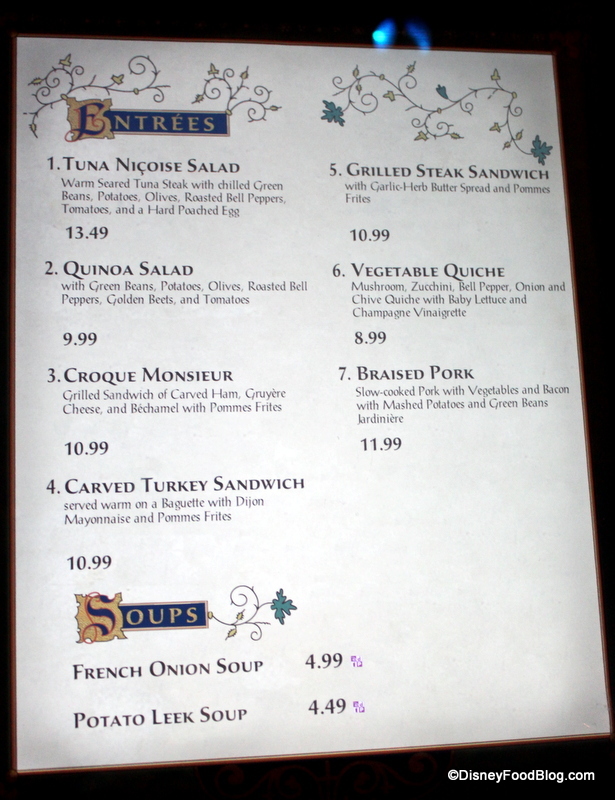 UPDATE: Please note that as of February 25, 2015, Be Our Guest Restaurant began to accept Advanced Dining Reservations for lunch. For further information, please click here. Last month I was so excited to bring you my “Everything on the Menu! 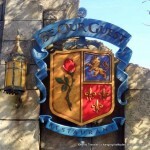 !” review of dinner at Be Our Guest Restaurant. Today, it’s time to head back into New Fantasyland for my very first taste of lunch at this must-do restaurant! We have a ton of great detail to cover, so let’s get right to it! 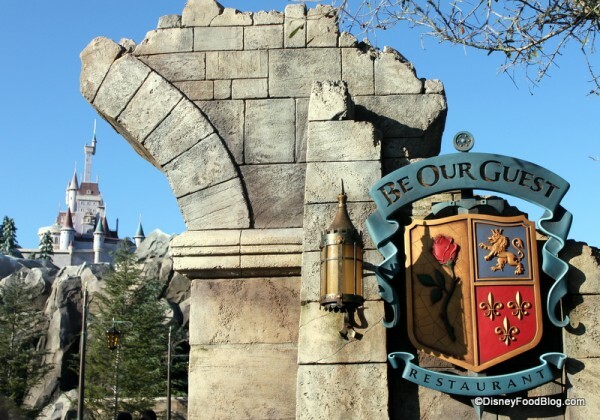 Amid a backdrop of rugged, austere mountains of New Fantasyland, you find the bridge and gateway that ushers you into Beast’s enchanted castle, home to Be Our Guest Restaurant. Now that the enormous eatery is officially opened, there are still extraordinarily long lines for lunch on many days, as guests await their turn to see inside and sample the food. We know that Disney is testing a fastpass like system and a pre-ordering for Be Our Guest, so the lines may soon be a thing of the past. But, in the meantime, be sure you know when they begin serving lunch (usually around 10am or 10:30am) so that you can get there early. Regardless, the line did move quickly (it’s about a 30 minute wait from the back of the bridge); and soon, I was walking into the castle. Once inside, you find pretty much exactly what you would expect: low-lighted spaces with beamed ceilings reminiscent of medieval European castles. Enchanted suits of armor guard the long entryway. 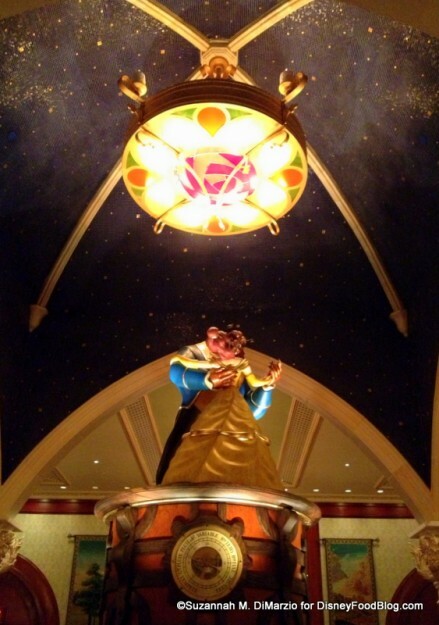 At the end of the hall, you see the stained glass window depicting Belle and Beast’s famous dancing scene. 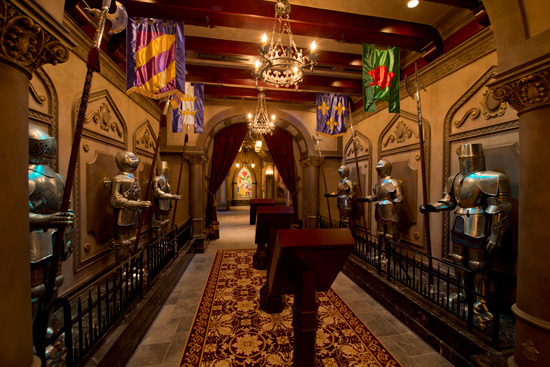 Listen closely, and you’ll hear the suits of armor murmuring to each other in French accents! As you enter the ordering area, thoughtful touches tell you that you’ve arrived in the beast’s library!! This ornate room is home to a cozy fireplace and Beast’s enormous chair. You’ll also find the automated ordering areas masquerading as stacks of books! It’s to be expected that they are still ironing out some of the kinks in how this new concept works. So be prepared to wait in line to get in, and then for it to be a little confusing once you’re in the ordering area on busy days. 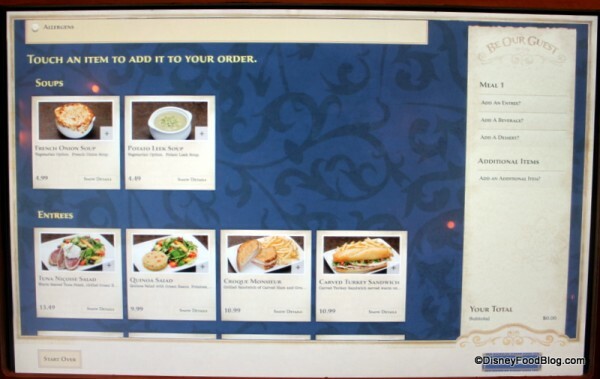 At lunch, when it’s your turn to order, you’ll be directed either to a cast member who will take your order (similar to a traditional Disney counter service location, like Columbia Harbor House) or to a self-serve kiosk, like those we’ve seen at Captain Cook’s and Pecos Bill’s — pictures here and here. 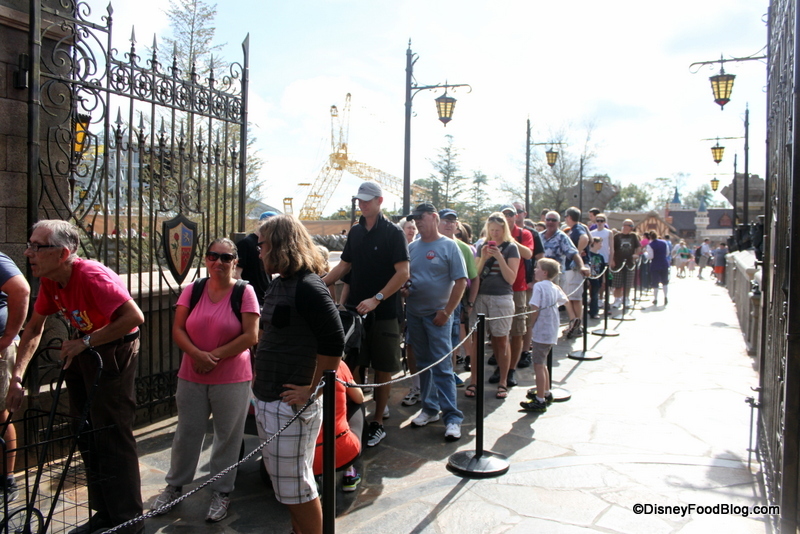 If you prefer one or the other, be sure to tell the cast member when you get to the front of the line. And don’t forget to pick up your Magic Rose! Your magic rose is programmed to help your food find you where ever you are in the restaurant! 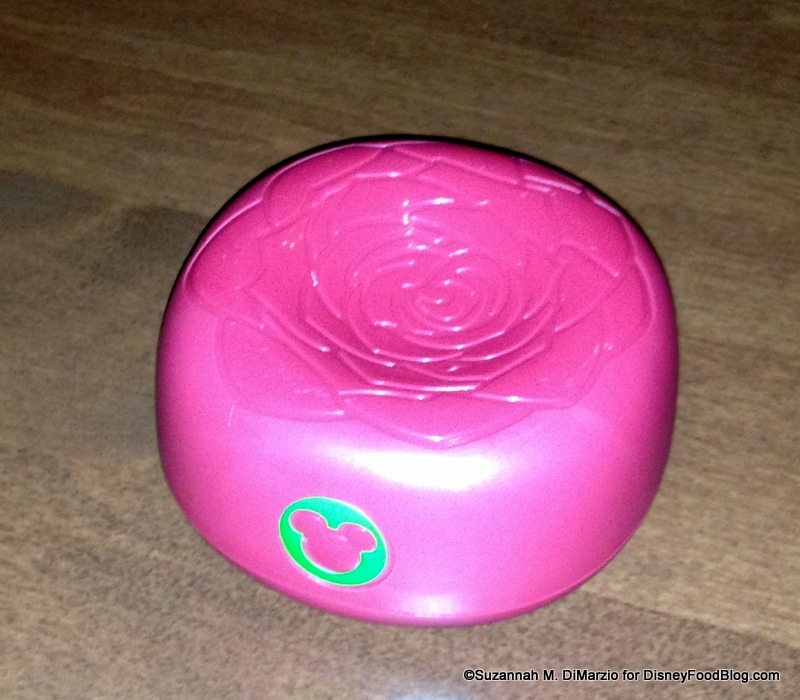 Magic Rose So Your Food Can Find You! Banners over the kiosks tell you which number you’re using, so if the cast member directs you to kiosk 1, you’ll look for this flag. 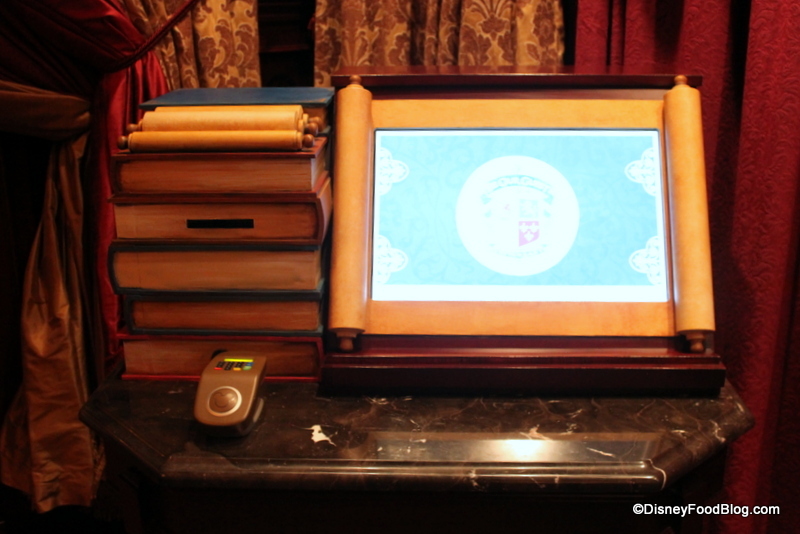 The kiosks themselves are dressed up as stacks of books and scrolls, and the screen itself is displayed on a scroll. I love this thoughtful touch. It’s just so fantastic that they’ve carried the themeing to these lengths. 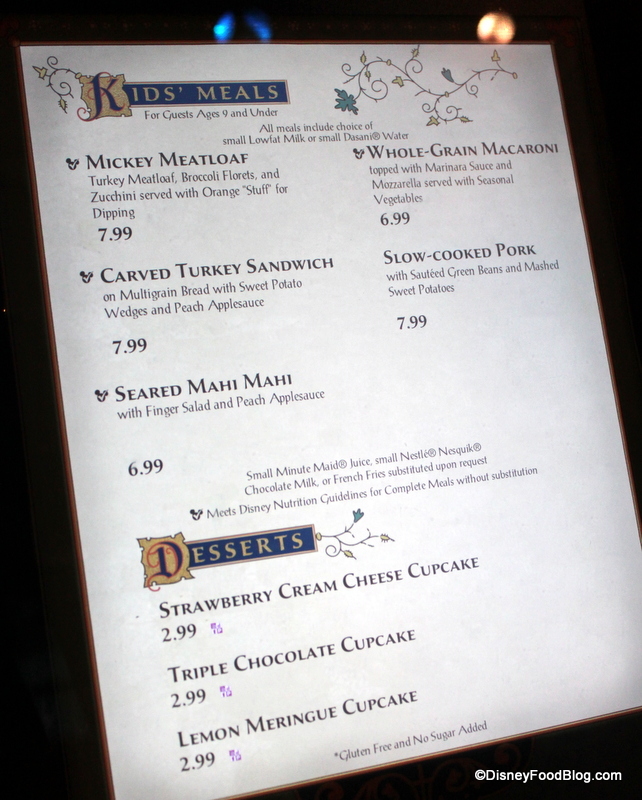 You’ll find menus on the kiosks (pictures in a second), but there are also menus above the kiosks and posted outside the ordering area, so you should be well acquainted with your options before you’re up to bat. 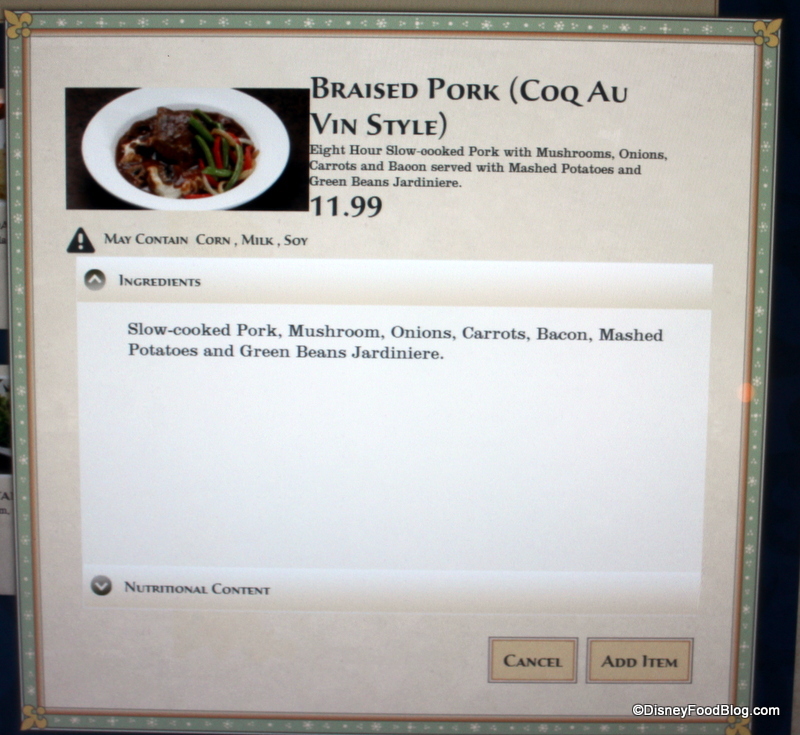 The menu offerings for lunch, like dinner, are few. There is a good assortment, however, with salads, sandwiches, and vegetarian options all represented. You won’t find any hamburgers or chicken nuggets here. Likewise, the “healthier for you” options continue on the Kids’ Menu. You can see the Mickey Check on four of the options, indicating that they’re choices which adhere to the Disney Nutrition Guidelines for Complete Meals. We’ve been told that mac and cheese is now on the kids’ menu as well. We have a tour of the kiosk screens here for you as well! 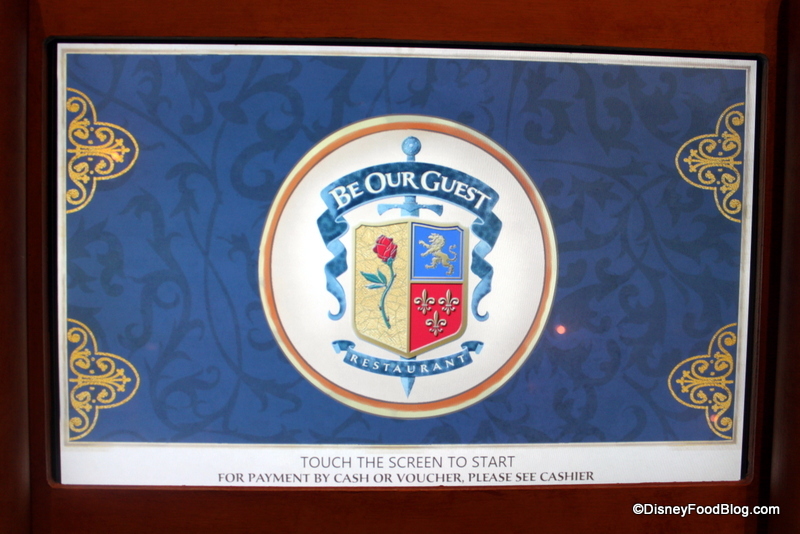 The home screen lets you know that cash or voucher orders must be handled by a cast member. 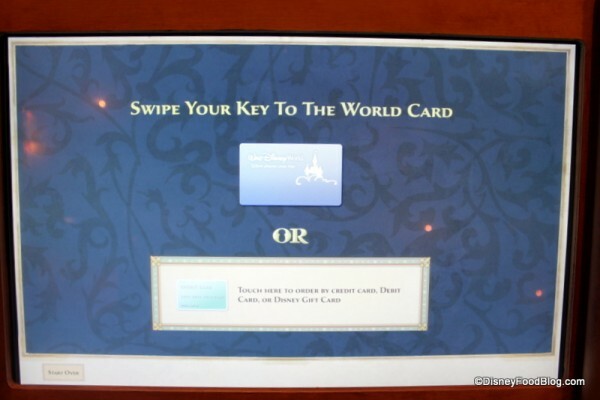 Next, you’re asked method of payment — whether you’re using your Key to the World Card or credit, debit, or Disney gift card. 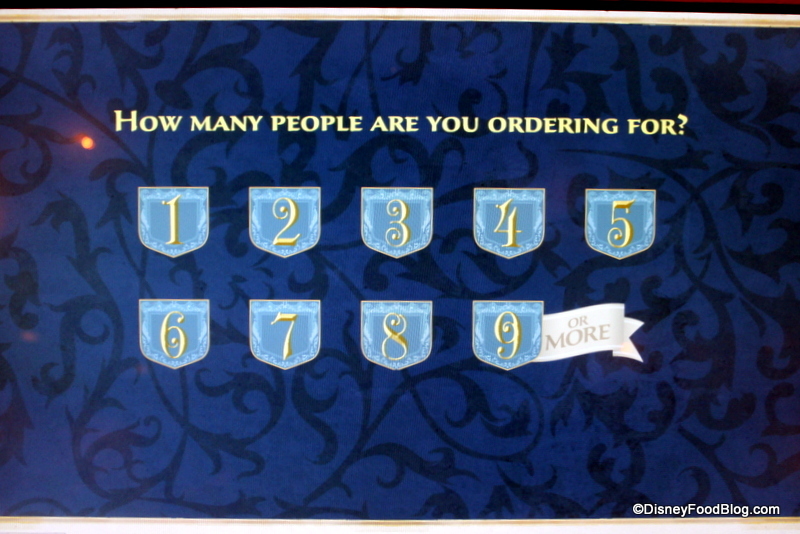 After that, you’re prompted to enter the number of guests in your party. From this point on, the ordering process is similar to other kiosks around the resort. The pictures are a great touch, though. 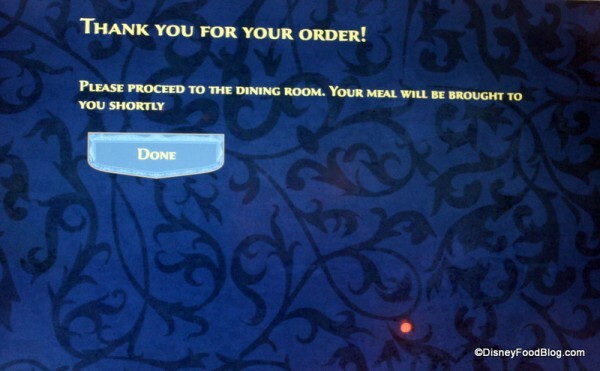 It’s always helpful to see what you’re thinking of ordering before you commit! 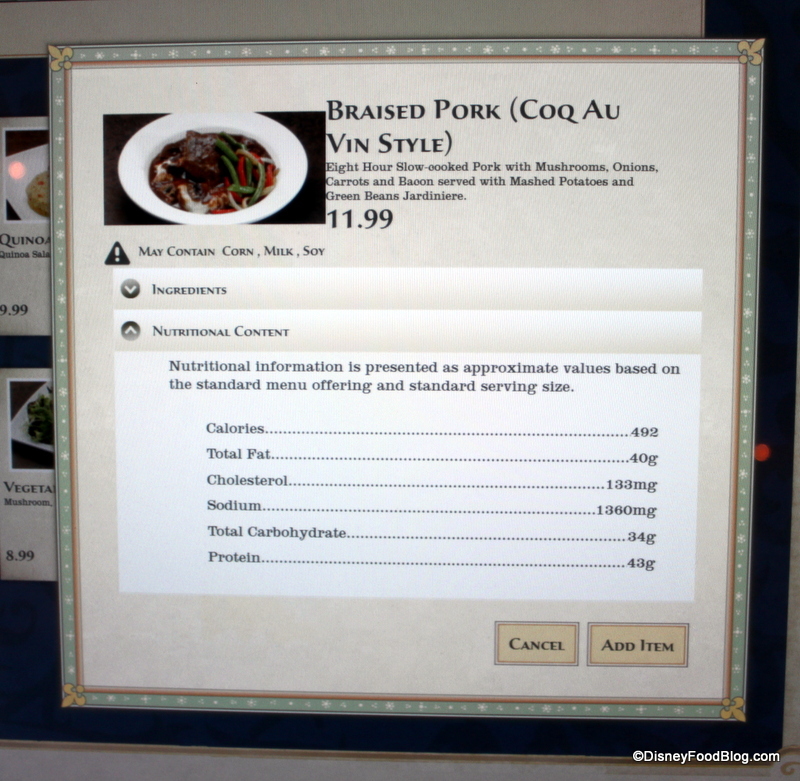 The menus also include nutritional content for the dishes (!!!!!!!!!! ), so if you’re watching your intake of calories, fat, carbohydrates, etc. you can easily compare your options. Your can also see exactly what ingredients are included in that dish you’re considering — especially great for those battling food allergies. 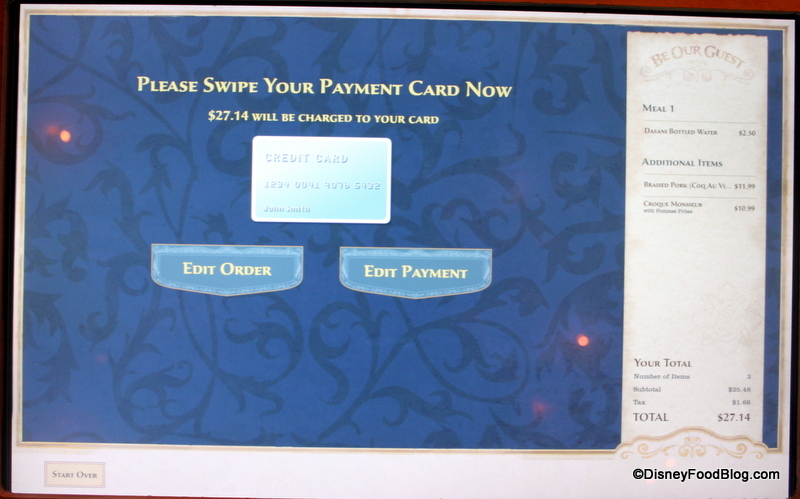 Once you’ve completed your order, you’re prompted to swipe your card in the special card reader to the bottom left. 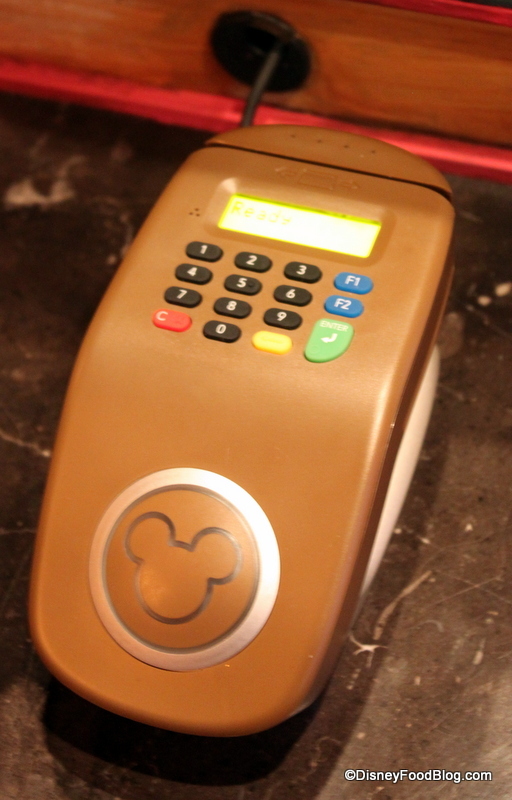 You’ll hold your Magic Rose to the card reader, too, so that it can store your information making it simple for your food to find you at your table. Just be sure to follow instructions and find your table immediately. Once seated, set your rose in the center of your table, and it does the rest! And with that, you’re set! 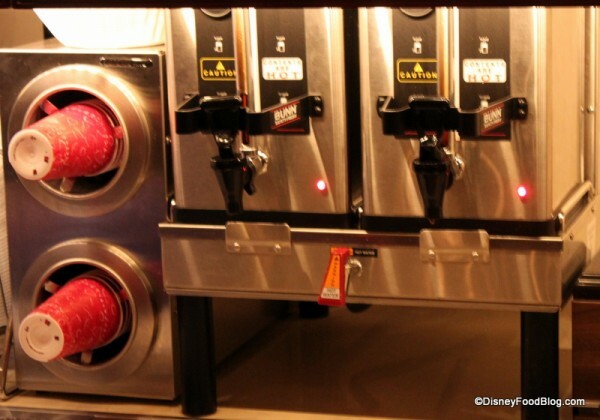 En route to your table, you’ll find the beverage stations, complete with cups, lids, straws, and condiments. The beverage counters are beautifully blended into their surroundings. 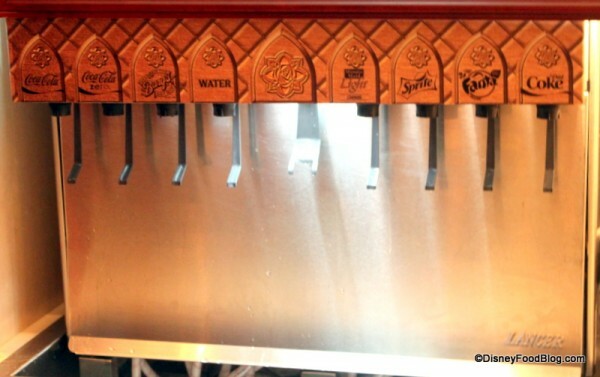 Seriously — look how pretty these fountain machines are! 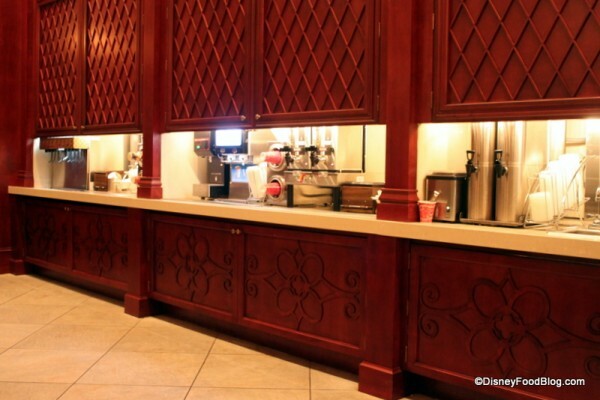 Although your food is delivered to your table, you pick up your (real) silverware and napkins at stations near the beverages. It was time to choose a table, but first, I’ll wander around a bit and show you the lay of the land! 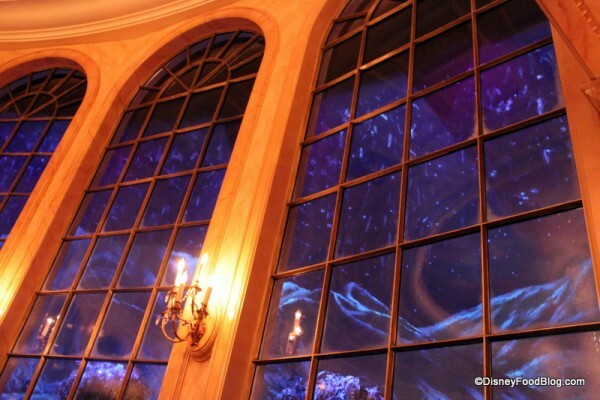 During lunch service there are three dining rooms available: the Ballroom, the Rose Gallery, and the West Wing. During dinner, only the Ballroom and West Wing are available (currently). This obviously means the space can accommodate far more guests for lunch. The Ballroom is a nice spot to dine. You really do feel as though you just stepped into the movie when you look at it. One warning, though: because of soaring ceilings and lots of hard surfaces to the top, bottom, and sides, this space is ridiculously loud. That was very off putting for me personally, and a bit of a disappointment. The detail is incredible, however. And the snow falling outside of the picture windows is just lovely, and makes the inside feel almost cozy by comparison. Hands down, we are hearing that everyone’s favorite dining room (including mine!) is the West Wing. And why not? This is where the story of Beauty and the Beast really begins to unfold. 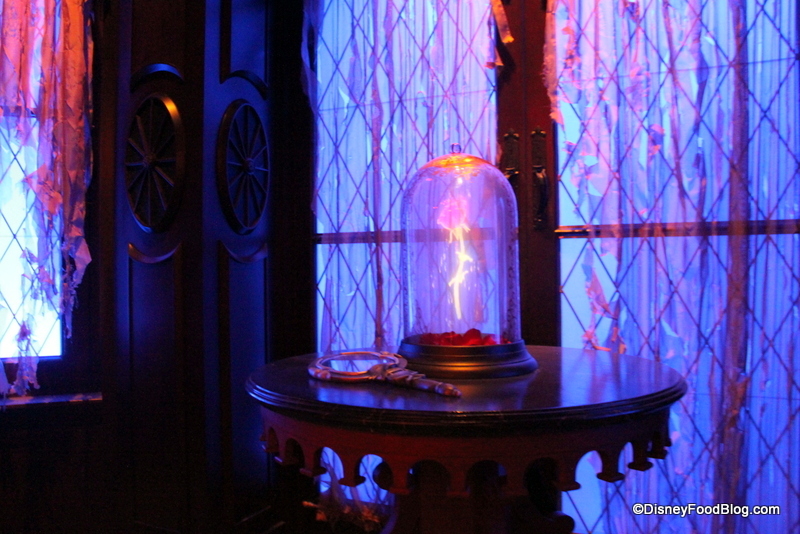 Here, you’ll find the rose given to Beast by the beautiful enchantress. The rose foretells Beast’s fate if he doesn’t fall in love, and cause someone to fall in love with him in return… . And during your meal, you’ll be able to watch the petals slowly fall from the rose! 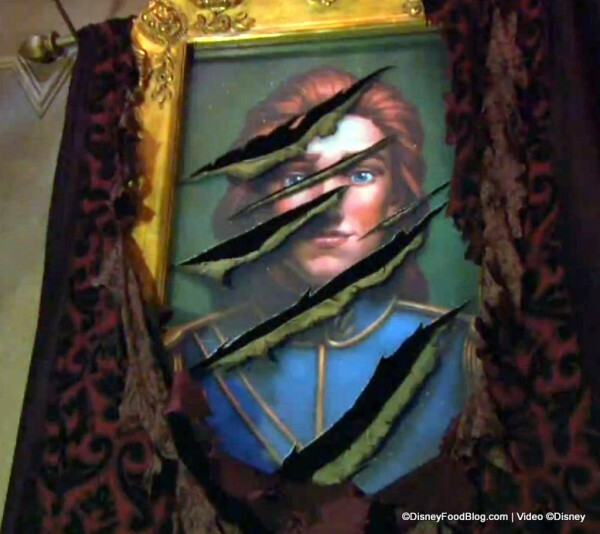 You also find the portrait of the Prince that Belle stumbles upon when she goes exploring the West Wing. And in true Disney fashion, the portrait transforms for a few seconds every 20 minutes or so! 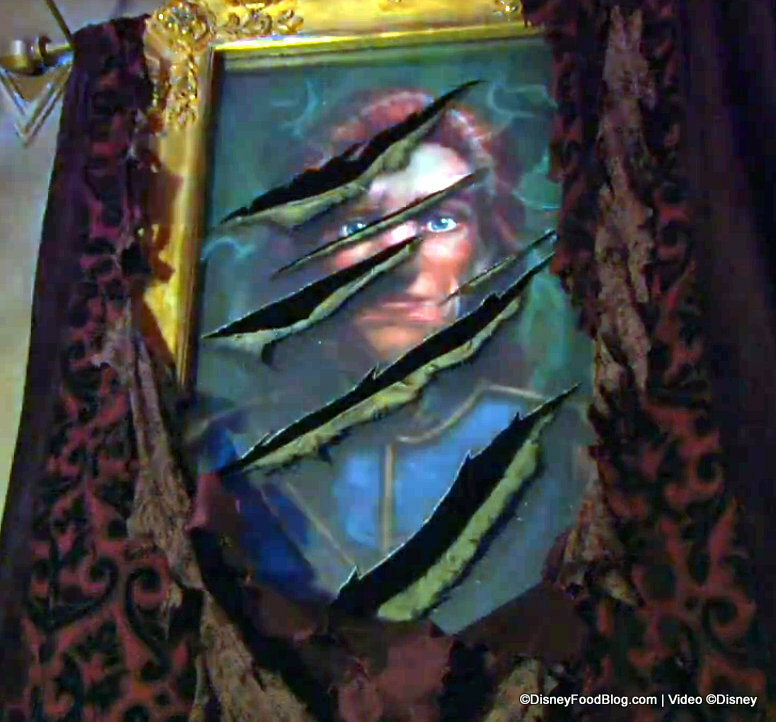 Watch as Beast takes the place of the Prince in the portrait! 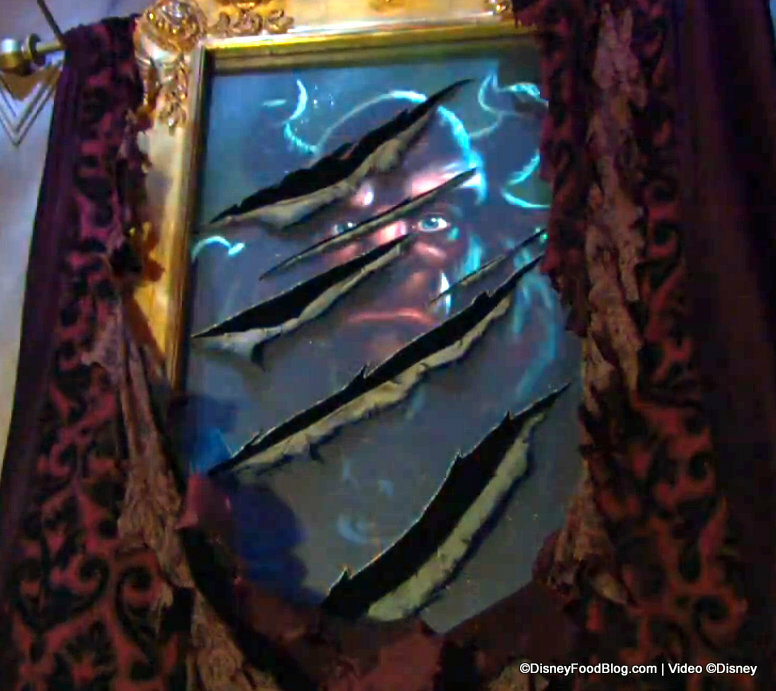 And if you pay close attention, you’ll witness the change from Prince to Beast when the lightning strikes! This particular dining room will not be found in the movie. Imagineers included it as an opportunity to pay homage to the film’s other characters, many of whom are included in portraits throughout the Rose Gallery. The centerpiece is this beautiful, larger-than-life rotating music box. The story behind it? 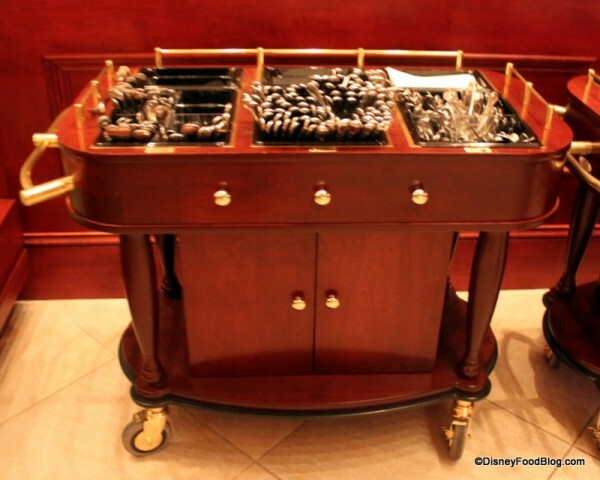 Maurice, Belle’s inventor father, created it as a wedding gift for Beast and Belle. When you have the opportunity to dine at Be Our Guest, whether it be for lunch or dinner, be sure to carve out some time simply to wander around the space and take in all the marvelous detail. It truly is amazing. Once you choose your dining room, take a seat and set your magic rose on the table. 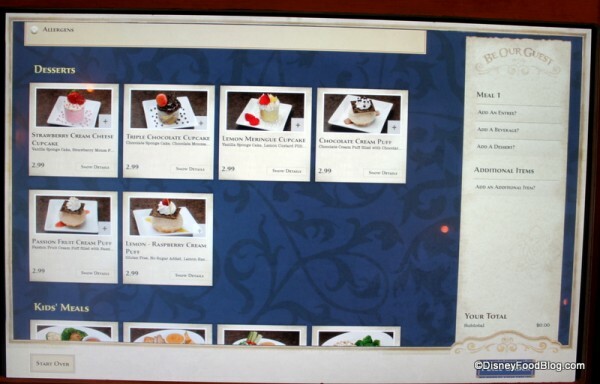 One of the coolest details about Be Our Guest is the way your food finds YOU! 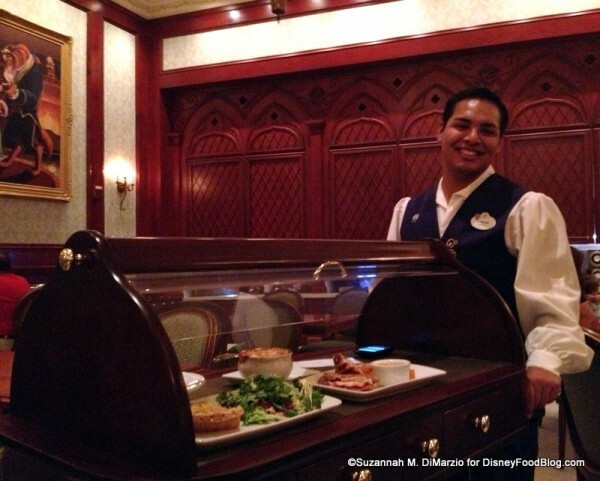 That magic rose really works, because shortly after you’re seated, your food wheels up to your table on a cute little rolling cart. Hot foods are stored under the curved glass above, keeping them safe and clean as they traverse through the dining rooms. Cold items are kept in a lower compartment. But it’s finally time to see what we actually had to eat! 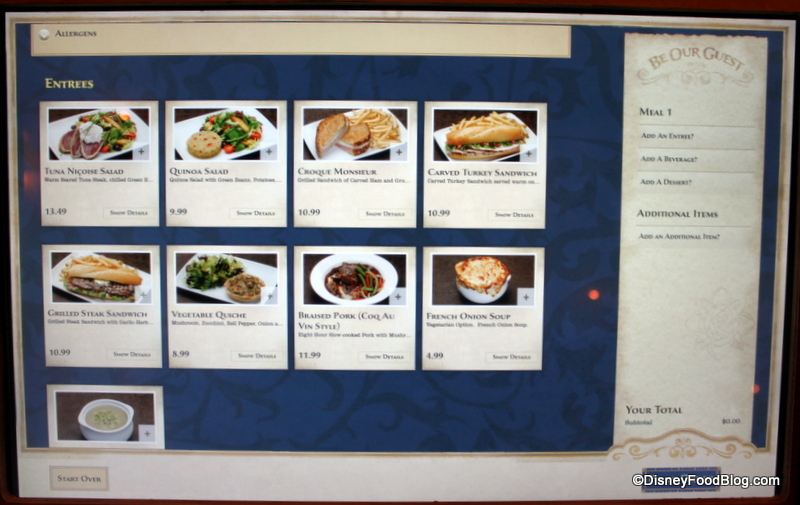 We chose two wonderful dishes for our first trip to Be Our Guest for lunch. 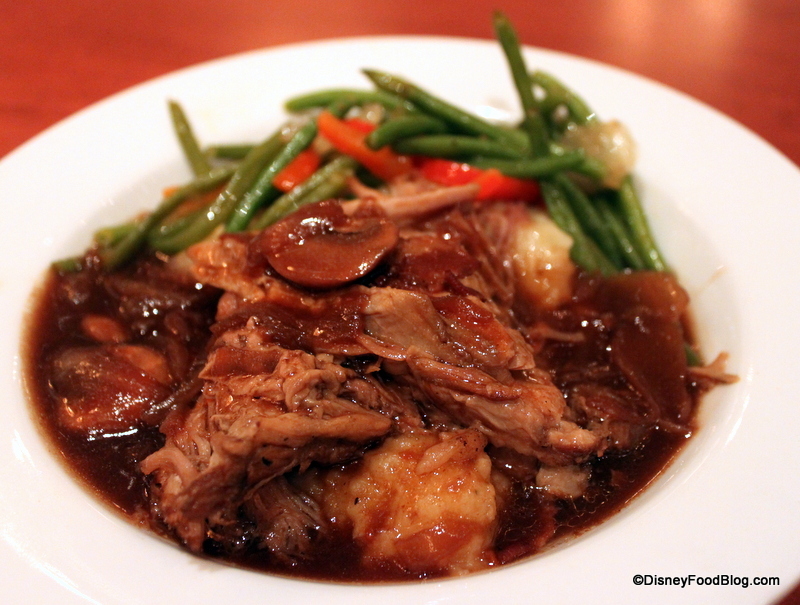 First up: the Braised Pork, Coq au Vin Style. The dish of pork that’s slow-cooked for eight hours is rich and delicious, a perfect comfort food item, and an excellent option to represent this French cooking method. You really would expect to find this type of dish in a French castle! 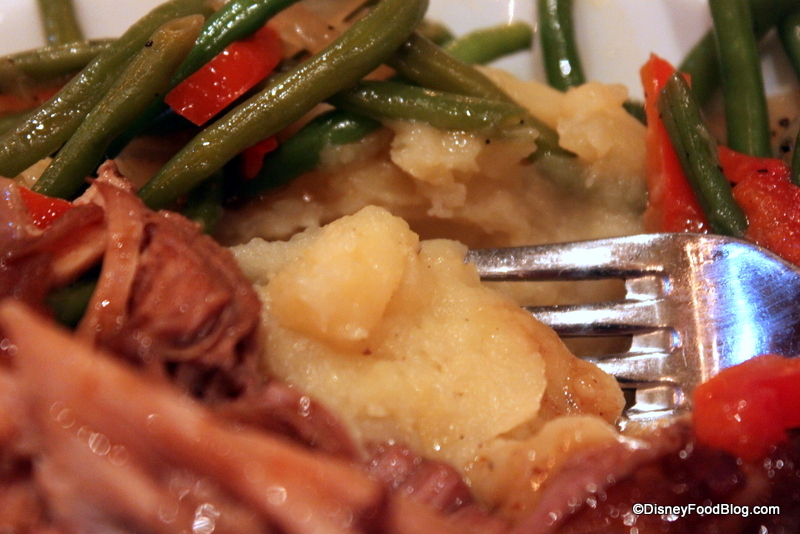 The meat was very flavorful and tender (but not mushy), and I enjoyed the veggies as well. But I was most impressed with the mashed potatoes! As far as I could tell, these were real — lumps and all! they were great with the mushroom gravy. 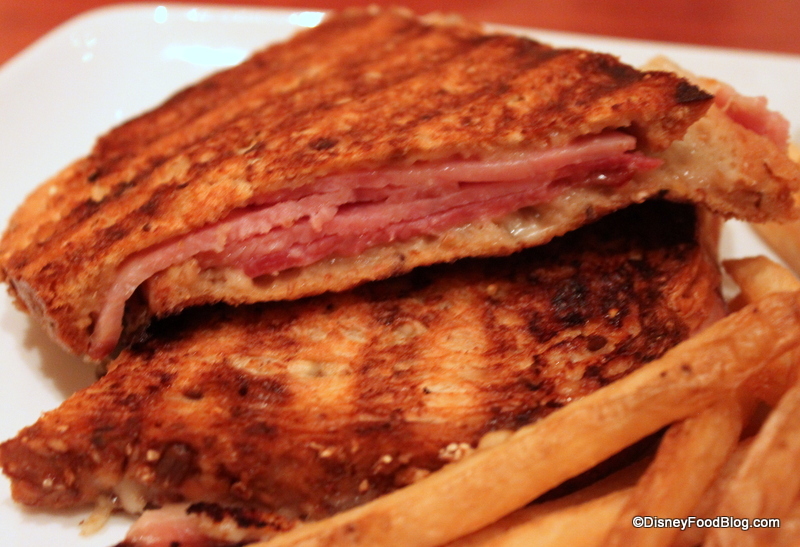 And I simply HAD to try the Croque Monsieur. 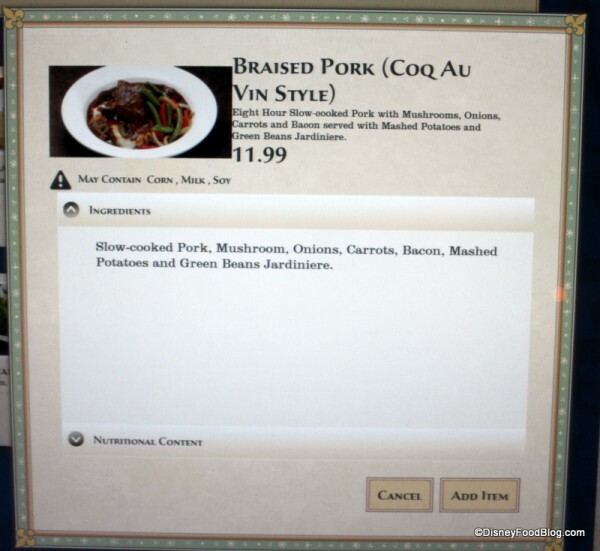 This was one of the dishes that caught my eye waaaaay back when we first reported on the menu at Be Our Guest Restaurant. The grilled ham and uber-flavorful gryuere with bechamel sauce is a great grown-up sandwich. And considering I had my very first Croque Monsieur ever at the top of the Eiffel Tower, I’m guessing it’s also an excellent option for a French-inspired menu. And while I wasn’t absolutely wowed, it was very good, and worth the price. The sandwich is served with pomme frites. They were basically fries with the skin still on — pretty standard, but good. 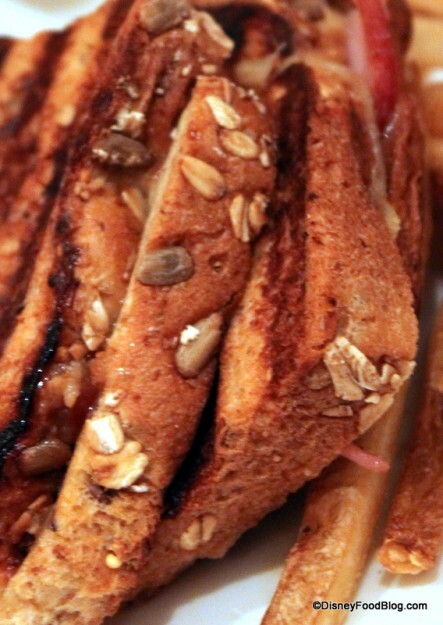 The multi-grain bread has a lovely, chewy texture that adds a little more interest to the sandwich. I’ve heard that some kids aren’t fans of this bread, so speak with a cast member before ordering if you need it on a different type of bread. And with that, we were ready to call it a day! Desserts and Soups at lunch are the same as they are at dinner, so be sure to check out our EVERYTHING on the menu review to see all desserts and soups! Note that these are a Disney Dining Plan snack credit if you’re dining at lunch! 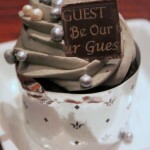 A trip to Be Our Guest, whether for lunch or dinner, is an experience and an event. 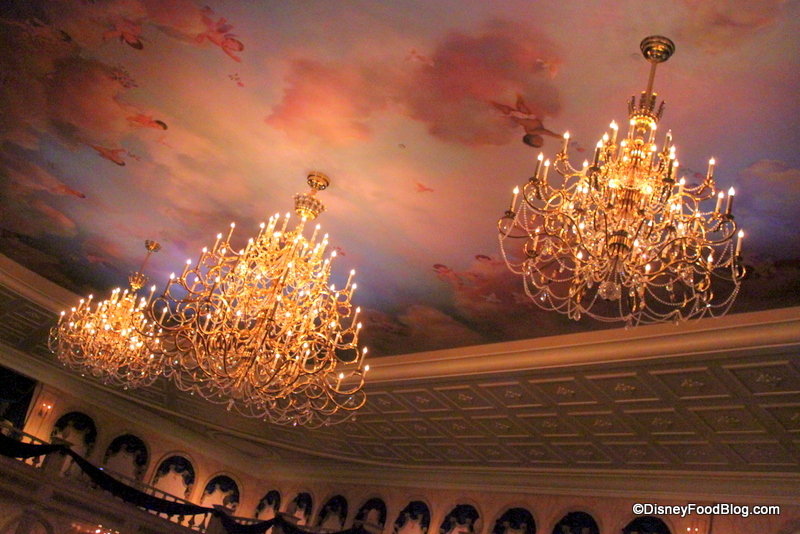 It’s very clear that Imagineers sunk a huge amount of time and energy to cover every detail imaginable. You really feel as though you have stumbled right into the animation of Beauty and the Beast. And beyond that, the food that we have had has been great! 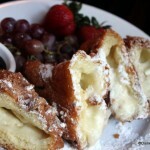 The menu, while small, is thoughtful, with flavors that truly capture the French spirit. And while we didn’t get the chance this time to try the kids’ items — well, there’s always next time! 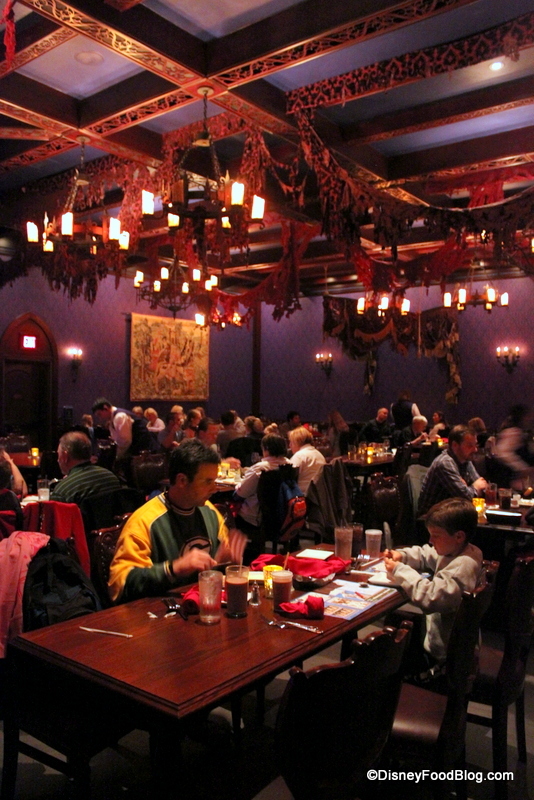 At this time, I would recommend braving the crowds to get to Be Our Guest. The excitement and hullabaloo is well deserved! Have you dined at Be Our Guest yet? Leave a comment below and tell us about your experience! 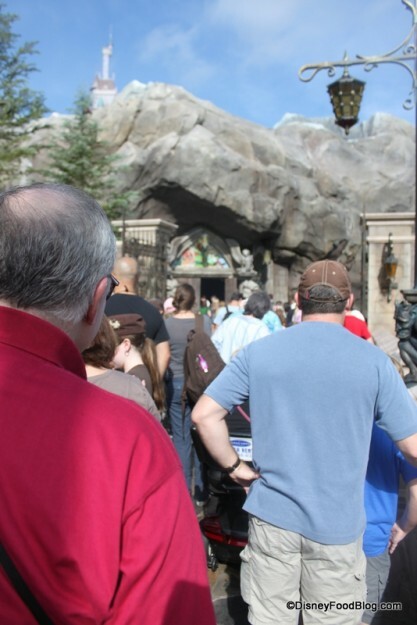 My husband & I went to Disneyworld after Thanksgiving 2012, we had the free dining but Be Our Guest was full and we couldn’t get in. I wanted to eat there soooo bad. A friend of mine told me that if I would go early and wait I might be able to get in. I had my husband wait at the resort and I went and waited in line for 2 1/2 hours and they came out and told me I could get it, I called my husband and he caught the bus and l just as he walked up they called us back! It was everything and more than I thought it would be. It was “AWESOME”, The dining hall was unbelievable, the food was to die for! It was worth the wait, I would to it again! And when the Beast walked in, I almost cried! I would suggest to anyone, if they can’t make reservations to go early and wait in line, I went about 4:00p. It’s worth every minute I waited! Our family was on the dinning plan and we decided to eat lunch and use our counter service meal. This was the best counter service meal we had at WDW and the line was not too long Several of us tried the pork roast and gravy and the others tried the roast beef sandwich. Both were very good and they gave you alot to eat. I’m not a cupcake person so I tried the passion fruit cream puff. It was good but nothing to brag about. The others in my party had the cupcakes and they enjoyed them. I think they need a bigger selction of deserts. But we did enjoy the castle and the atmosphere. Very nice! 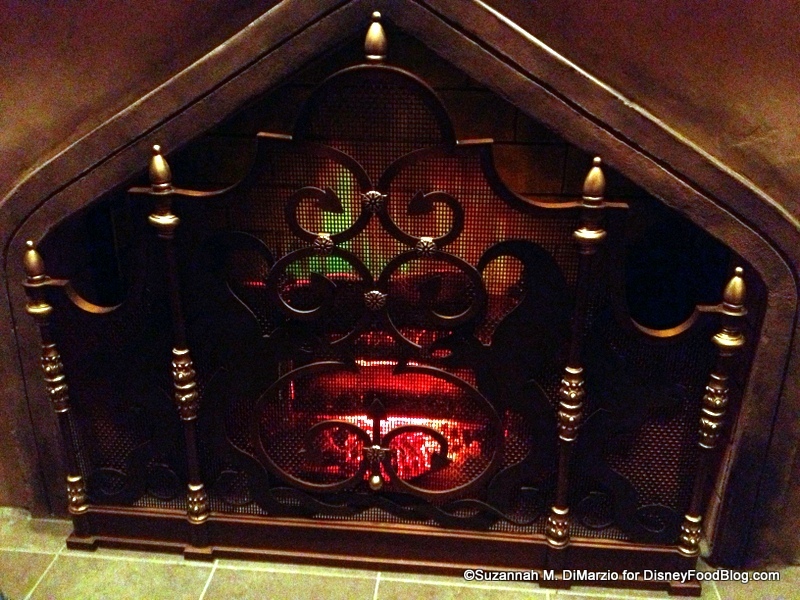 We just got back from WDW, and were thrilled to get a same day reservation to Be Our Guest. Reading this, it sounds like a quick service meal would be a better experience. 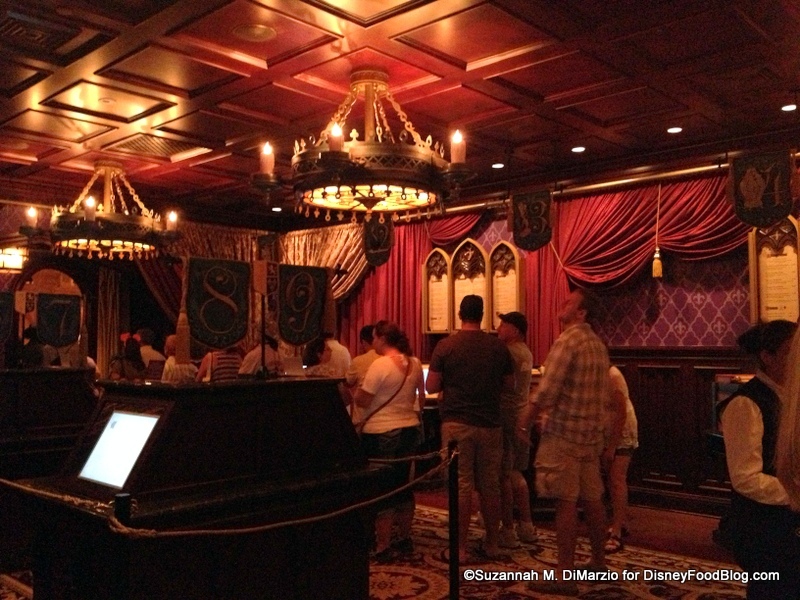 The menu was pricey, but not overly so, the atmosphere was great, but the magic? Lacking. 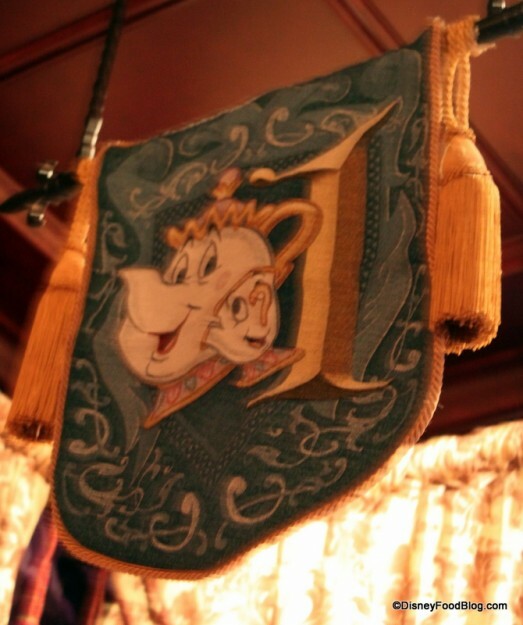 We were really thinking that we would see an enchanted castle with Lumiere, Mrs. Potts, Chip,…I mean, this is Disney! 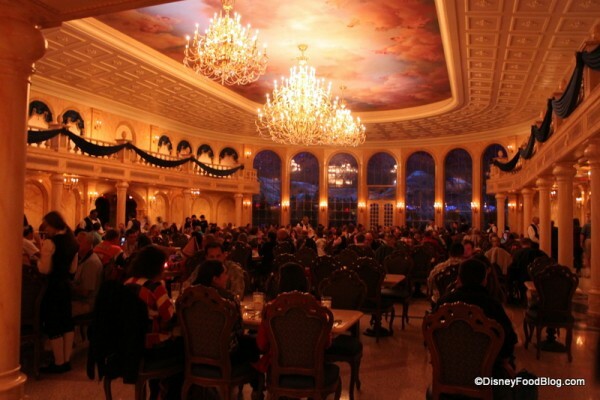 If they had been animatronics or even video in the wall that played “Be our Guest” every 15 minutes, that would have been okay,…characters visiting the tables like Chef Mickeys would have been better, but…there was nothing like that–really. I kept thinking about the Chef Mickey experience and how the “show” was better, and how after so much time and emphasis was put into this, there was no show, just atmosphere. Great, very accurate atmosphere, but lacking in heart. Beast was in his study for photos. I asked if there were ever other characters, and was told that there were not. Just thought I’d pop in with an update (as of last week) on some of the features of the restaurant. We waited about 40 minutes for entry on a Sunday afternoon, around 1:00. They are still testing their Fastpass system, and when I asked the cast member at the front of the queue, he said that they were doing random selection for that, resort guests only. I predict that the wait will get slightly more interesting once they open the new Snow White ride, as right now it’s a tad dull, with only the fencing around the construction to look at. The chaos of the kiosks that others have reported was nowhere in evidence for our visit, so it looks like they’ve smoothed that bump out. They are only letting one group at a time through the doors (and not until the whole party is present), which I believe might be a countermeasure to the confusion. 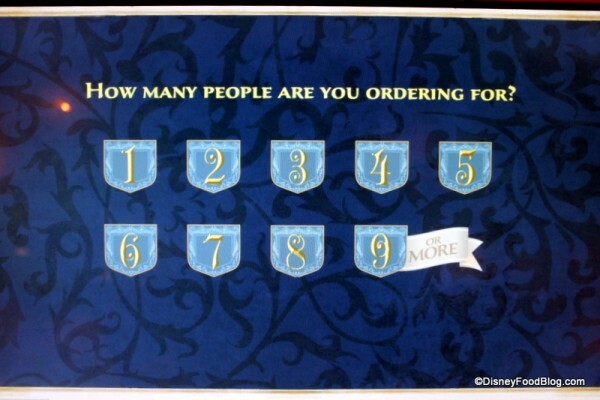 A cast member meets you at the head of the line, and directs you to a numbered kiosk for ordering. 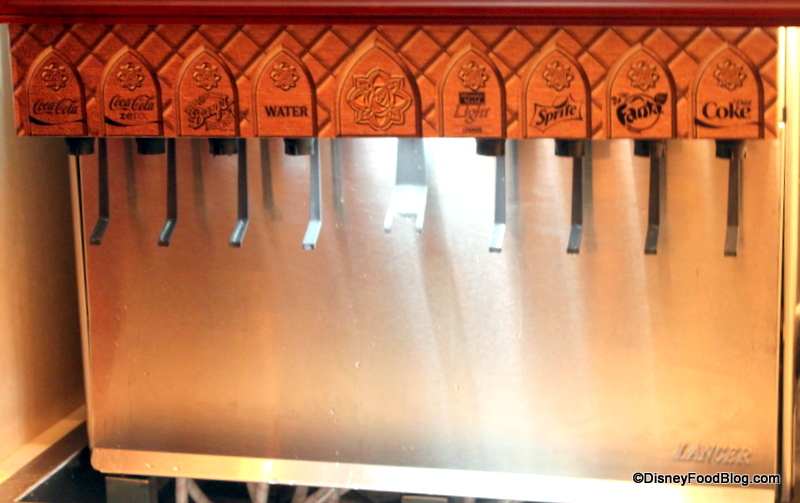 The soda fountains are exactly as impressive as in the picture (all the decor was! It was lovely! 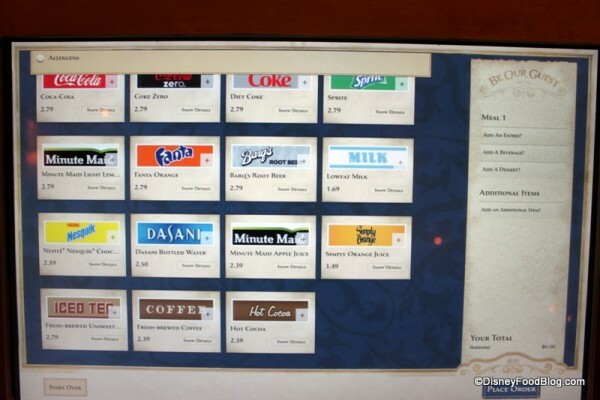 ), and (in a rarity for the parks) are free refills. Since this was our first meal of our trip, I didn’t realize at the time how unusual that was, but I appreciated it even more in retrospect. We ate in the West Wing, which was cool, dim, and pretty quiet. A nice oasis after the brightness of the day outside, which we took full advantage of. Gripes: when I asked for mustard for my croque monsieur, it took about 20 minutes to arrive, but the staff member was very apologetic about the delay. 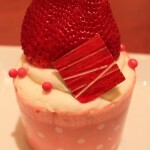 More irritating; I was so excited to try The Master’s Cupcake after reading about it here on the blog! I raved to all of my friends that I was going to get to “try the grey stuff, it’s delicious!” I believe the description I’d read was that it was a “cookies and cream panna cotta” so the bar was set kinda high. Instead, it was a very basic chocolate cupcake (with most of the middle scooped out) topped and filled with whipped cream that had been colored grey. A minor letdown in the grand scheme of things, but one I felt was worth mentioning. Still, everyone in my party left full and happy, so we will definitely go back! I am planning my trip, and thought we’d do this for lunch. I have a couple questions if anyone knows and would be kind enough to help me. It sounds like their is no reservations at lunch, but this is a fast pass option?? Is that correct and is it tier one or two? Does it shorten the wait significantly? 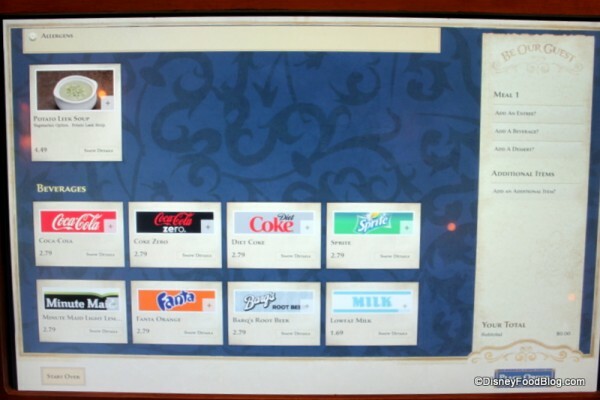 I want the kiosk option, but we have some allergies, and may wish to do some substitutions if possible. Is this possible at kiosk? Or will we need to use a person to order? Is the wait for food very long? After we wait just to order, do I need to plan another half hour waiting for food? But: Our kids both have severe nut allergies – when we stepped up to the kiosk at Be Our Guest we asked the cast member some detailed questions about preparation areas etc and he called out the chef. We waited on the side for about 5-10 minutes, which I think was pretty good for a very busy place! After the chef talk, we sat and it took no longer than anyone else to get our food. About 10-15 more minutes. Of course, we didn’t have to do any substitutions for anything like dairy or wheat, so if that is needed I don’t know how it would affect timing. Hope that helps – and enjoy! We had a dining plan and Be Our Guest was one of our last table service dining experiences. Unfortunately it was our least favorite restaurant. The room we were in was beautiful, it was off to the side of the main dining. The food and service were equally terrible and we were disappointed. That was the dinner I was most looking forward to. We booked it 6 months ahead of time. Will not go back. I keep hearing that you have to have reservations for Be Our Guests, BUT can you just walk up and put your name in to try to eat there? I wish I could rave as much as everyone here has experienced, but unfortunately I cannot. I am not referring to the crazy wait times in the lovely un-shaded Florida melting sun where the staff was actually handing out umbrellas and water. (Side note: I actually do love the heat & sun, but my wife… well, let’s just say Heat Miser vs. Freeze Miser-ess). I am referring to the food; Usually, Disney’s quick service foods are pretty decent, and above average, and I still cannot believe I am writing something bad about Disney (Sorry, Walt!!!). Here we go! 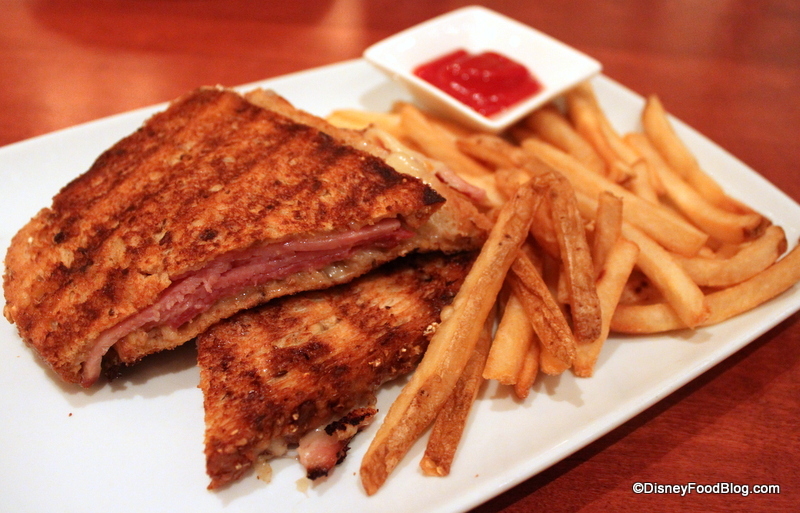 I ordered the Crock… err Croque-Monsieur (aka Grilled cheese with ham). The bread was not only flattened, but very dry and brick-like… In fact, I think my dentist emailed them a “Thank You” note. I also ordered the heated water with floating pieces of onion that was shipped from France, I guess. 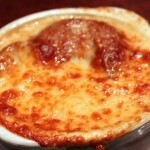 Though, they did try to hide the miserable soup by covering it with a piece of over-baked cheese. She ordered the Quinoa Salad. After seeing what she ordered I would like to refer to it as the Kay-NO’ah salad. It was so bland and tasteless (yes, it’s vegetables I get it, kids.) I think NASA astronauts eat better food than this. My kids were 2 and 3 at the time so we tried to stick to the basics. No chicken nuggets, but they did offer Mac n’ Cheese… I’m glad we brought them PB & J sandwiches as backup because I believe momma and I accidentally inhaled their meals when they said they didn’t like it… wooops! 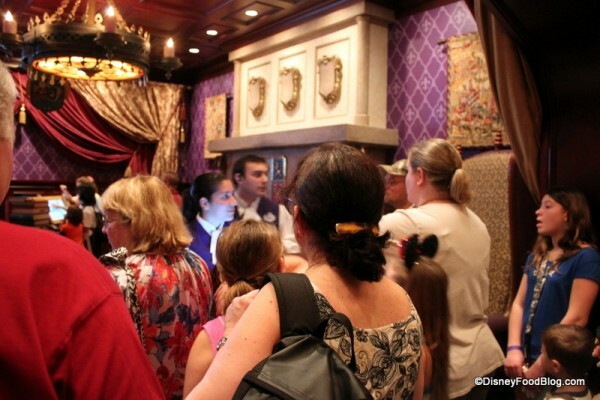 Please, do try the restaurant to at least experience the Disney magic in Beast’s castle. 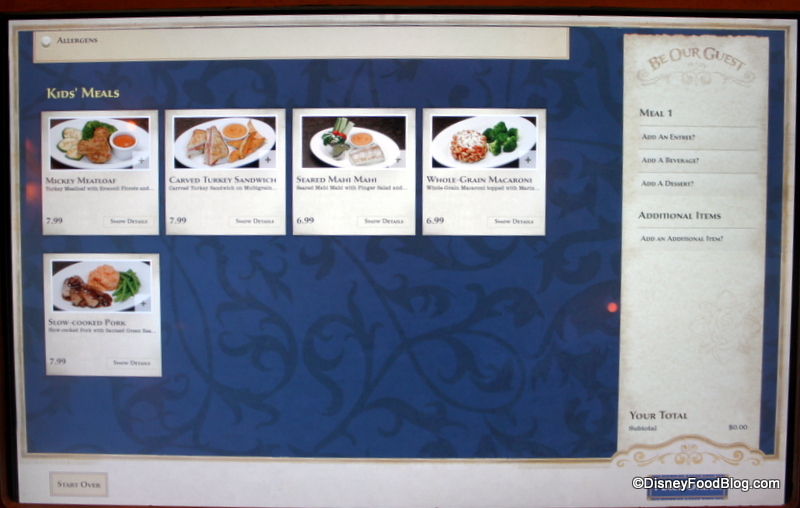 I am still reluctant to go there again.. perhaps my family and I were just the one unlucky family that had to experience this… Perhaps the dinner menu is more upscale, I’m not sure… but I do know Chefs de France in EPCOT serves a way better Coque-Monsieur!